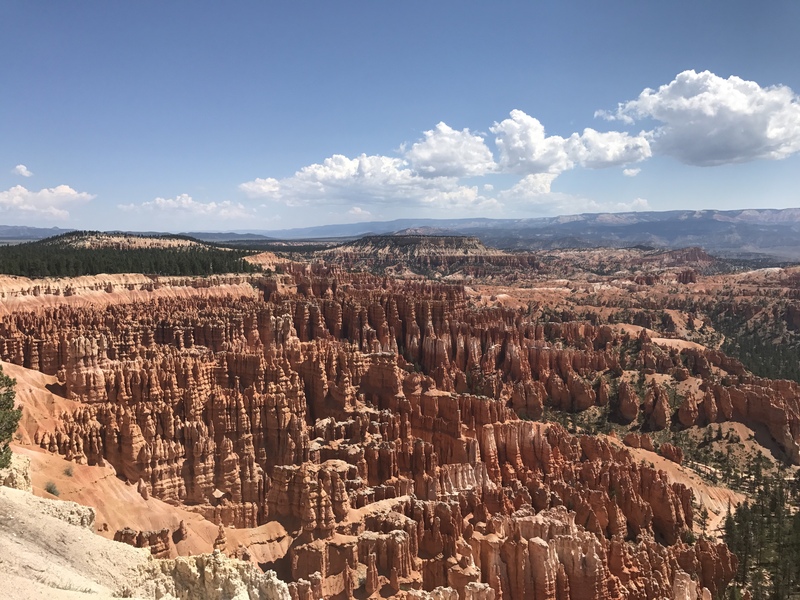 Alien, bizarre, and strange are all words one will associate with Bryce Canyon National Park. Hoodoos, as these amazing geological sandstone formations are called, remind me of voodoo – a word very closely associated with mystery. Best covered on the same trip as Zion, in the wonderland that is Utah, when visiting Bryce, consider staying in the sleepy town of Kanab, (equidistant from both) and a 3-4 hour drive from Las Vegas. Funnily enough, the drive through the park entrance is quite deceptive. Driving by the standard conifers and muddy roads, you will never suspect anything out of the ordinary. A few minutes into the park is when the first signs of oddity appear. Why do the mountains curve asymmetrically with uneven, crevices and crannies? Just as you wonder about the alien species that may have caused this, you reach the point on your scenic drive where all you can do is, get out of the car and breathe in awe. Every frame screams for attention. The more you think about it, the less any of it makes sense. But you take in all of it anyway. Much like life and its experiences. You are just – there; to witness nature and its wondrous events. They occur as they always have, neither seeking permission nor an audience. And so you are surrounded by a quorum of hoodoos formed by years of winds, water, ice, negotiating rock, sandstone and foliage. Some look like statuesque human faces. Others like objects more concealed. Overall, a joy to be among. Hikes along paved paths lead you to ever more picturesque view points. And the paths unpaved take you to views more pristine. Like always, remember to carry enough water & food to continue to remain human on these adventurous hikes. And of course take a part of Bryce back with you. Check out my previous blog on Grand Teton National Park and the one coming up on Everglades National Park! Next Everglades National Park – Swampy Grasses and Alligators!